Pottery, relief, 0.5L, pewter lid typically with figurine. From the 1888 until the onset of World War I, German males between the ages of 17 and 20 were obligated to serve a period of active military duty (two years in the case of infantry regiments) after which they became reservists, subject to recall through the age of 45. 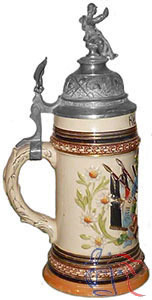 Upon completion of active duty, reservists often purchased souvenirs in remembrance of their experience, personalized beer steins being the most popular of these service mementos.